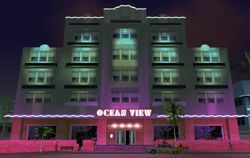 The Ocean View hotel safehouse in GTA Vice City. Safehouses or hideouts are buildings which houses the save point that the protagonist must physically enter in order for the player to save the game. Safehouses are a subset of save points, as they are more than just a floating save icon. Some safehouses offer garages to store vehicles and a place to change the player's clothing. Prior to Grand Theft Auto: San Andreas, most Save Points were outside safehouses. In Grand Theft Auto: Chinatown Wars, some safehouses include seclusion where the player can take hijacked vehicles with stolen contents to search. Jesus Saves in Grand Theft Auto 2. This page was last modified on 29 September 2013, at 17:33.